Home Blog Are Inflatable Kayaks Safe? “Right, let me just get this straight. We’re going to paddle in that lake in this blow-up boat thingy?!? Are you sure it can hold our weight? What if it bursts?” Can you imagine? That was my partner’s response the first time I took her aboard my Sea Eagle SE370. The only other inflatable craft she had been on was a Lilo in the pool last summer holiday. Those inflated plastic beds fold under the tiniest of movements, so I guess her anxiety was warranted. However, inflatable kayaks (IKs) are a completely different kind of inflatable – thank goodness. They’re well-built, rigid, and are more than capable of crossing lakes, cruising rivers, and some models are even rated to tackle Class III rapids. If you still have your concerns over the reliability, strength, and safety of inflatable kayaks, let us put your doubts to rest. First though, why would you buy an inflatable kayak over a traditional kayak? With hardshell kayaks available for a price that won’t break the bank, why would anyone bother with an inflatable? Low Cost – High-quality inflatable models can be picked up for under $200. Storage – Once deflated, they pack away into a bag no bigger than a backpack, making them perfect for anyone with limited storage. Transport – Their compact design also makes IKs incredibly easy to transport. There’s no need to fit a roof rack as inflatables will easily fit in the boot space. Lightweight – Easily carried to the water and for portages. Their low weight also makes inflatables very responsive in the water. However, it’s not all thumbs up, and there are a couple of downsides to inflatables. Firstly, there is the setup time required to pump up the kayak, and then to wash it down, dry it, and pack it away at the end of the day. Foot pumps reduce the inflate time so that it’s on par with having to secure a traditional kayak to a roof rack, but cleaning and drying the kayak before deflating – which is essential for its longevity - does take a while. Secondly, inflatables are lighter and are more susceptible to cross winds. Although most IKs come with a skeg that helps with tracking, they are harder to keep on a straight path than heavier boats. Over the years, innovative design and the use of technology-advanced materials has improved the endurance and reliability of these crafts. Sharp objects, such as rocks on the river bed, still pose the greatest risk to inflatables. General wear and tear from abrasions as well as the breakdown of the plastic and rubber polymers from UV rays is also a concern over the long term. But modern inflatable watercrafts are made from materials carefully selected for their strength, ruggedness, and water and tear resistant properties. They add strength to the vessel yet remain flexible under load allowing the boat to absorb impacts with ease. What Exactly Are Inflatable Kayaks Made From? Synthetic rubber outer coating that provides protection against abrasions and weathering. Several layers of nylon or polyester woven fabric giving the boat high tensile strength and dimensional stability. 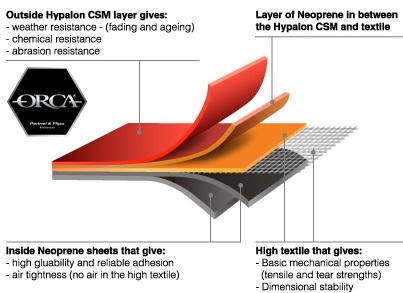 Inner neoprene fabric (with no air bubbles) that provides air tightness. The following diagram from Orca shows how the layers are combined. More information on inflatable boat materials can also be found here. Developing a puncture when your miles away from shore is always going to be a fear for some paddlers. But there’s no need to worry, modern inflatable kayaks feature a dual or multi-chamber design that allows the inner chambers to remain inflated in the event of a tear to the exterior. IKs will still function with a single chamber giving you plenty of time to make it back to shore safely. Punctures are easily repaired and most kayaks come with a patch kit. Contrary to what you might think, inflatables aren’t soft and flimsy once inflated. Double stitching, the use of tough nylon and rubber, and superior-quality valves mean these boats can be inflated to high pressures safely. The tube wall design of these vessels also makes them incredibly stable. They're usually wider which provides a low centre of gravity, and unlike v-hull boats, their entire hull is flat against the water providing increased stability. Passengers can stand up on the boat with no fear of it tipping. Buoyancy determines how much weight a boat can carry before it starts to sink, and is therefore a primary concern of all boats. High buoyancy is crucial to overall safety as it keeps the boat afloat under heavier loads and also means you’ll be sitting higher (and kept dry) relative to the water’s surface. Inflatable kayaks are usually more buoyant than regular kayaks due to the inflatable tubes around the perimeter of the boat distributing the weight across the whole area, which increases the overall buoyancy. Common sense will tell you that inflatables shouldn’t be used in shallow waters with rocky beds, on turbulent rapids or for long expeditions. Common sense should also tell you to always carry a puncture repair kit and a foot pump on board. Preparation is key when it comes to remaining safe with IKs. You should also perform routine maintenance and regularly check for damage and the progression of general wear and tear. Regular maintenance and preventive action, such as washing off salt water after use to avoid delamination of the materials, will help to extend the life of your inflatable and ensure it remains safe for use. So, are inflatable kayaks safe? I think you’ll agree that inflatables are most definitely fit for purpose and safe as long as they’re used the right way. Modern inflatable boats are strong, durable, and almost match the responsiveness you get from a solid shell kayak. They're also more buoyant and stable than traditional watercraft, increasing their overall safety for beginner paddlers. And when you take into account the ease of storage and the portability of inflatables, it’s easy to see why many paddlers are choosing IKs over traditional boats. Looking for a new inflatable boat?